The city of Maitland is situated a few miles north of Downtown Orlando and just west of Winter Park. The area is known for its quaint, yet growing, downtown area as well as its large business district. The charming area of Maitland offers an abundance of outdoor, cultural and entertainment activities for just about any type of resident. While downtown Orlando and the theme parks are only a short drive away, this bustling Orlando suburb has created its own local allure. The beautiful Lake Lily is a focal point of many festivals and events, including the annual Maitland Arts Festival, the only night-time fine art show in Florida, complete with live entertainment. Also known as "The Venue on the Lake," Lake Lily also hosts many food truck events as well as a weekly farmer's market. Some of Maitland's other bodies of water include Lake Sybelia and Lake Minniehaha, which are wonderful getaways for fishermen and water sports enthusiasts alike. The Audubon Center for Birds of Prey offers any aviary lover a unique experience. Bald eagles, hawks, owls and many other types of raptors are rescued and rehabilitated at this facility. Howell Brand Nature Preserve and Park is another prime location for you to pack your camera and capture the beauty that natural Maitland has to offer! The Jewish Community Center, for example, offers many family activities, including award-winning childcare options. History buffs will be thrilled to visit one of the fantastic museums in this area, including The Holocaust Memorial Resource and Education Center of Florida and the variety of exhibitions housed at the Art and History Museums of Maitland, including the Waterhouse Residence Museum and Carpentry Shop. Even just taking a drive through the area of Lake Catherine will transport residents back to the Victorian era, complete with some of the most beautiful century-old homes! The Enzian Theatre is one of the most well-known landmarks in the Maitland area. This alternative cinema offers visitors a unique experience, combining both food and film. It is home to the annual Florida Film Festival, as well as the very popular outdoor series, Wednesday Night Pitcher Show. Athletes and fitness enthusiasts will be impressed by the world-class RDV Sportsplex. As the former practice facility for the Orlando Magic, this facility boasts an Olympic-quality pool, three basketball courts, multiple fitness rooms, an array of weight and cardio training options and a full-size ice rink! Maitland is beginning to hold its own with their variety of local restaurants and entertainment in the Central Florida area. Antonio's is a great location for any fan of Italian fare. The bottom floor houses the café and market, complete with fine foods, wine, liquor, meats, cheeses and produce. The upstairs portion serves as the formal restaurant; the perfect location for a romantic date night. Rangetsu and its Orchid Lounge offer some of the freshest sushi, refreshing drinks and delectable Japanese dishes in the area. The Eden Bar at the Enzian Theatre lets you dine al fresco and is a very popular spot for many Maitland natives. If you find yourself looking for a night on the town, Jazz Tastings is a wonderful venue to enjoy live jazz music along with your favorite bottle of wine. Speaking of wine, The Silly Grape Bistro Wine Bar is a fantastic place to unwind with friends after a long day at work or a hot spot for a night of enjoying your favorite wines and beers. There are a number of high-quality schools serving apartments in Maitland. Children in grades K-5 are zoned for Lake Sybelia Elementary, Dommerich Elementary, or Hungerford Elementary. Middle school students are zoned for Maitland Middle School. High schools serving the area include Wekiva High, Edgewater High, and Winter Park High. Private schools are plentiful in the Maitland area. Some of the larger private schools include Orangewood Christian School, Park Maitland School, Lake Forrest Preparatory School, and Saint Mary Magdalen. Please note that public school zoning is subject to change from time to time. Please visit the Orange County School District Website to confirm school zones before making a housing decision. There is a limited amount of shopping in the actual city of Maitland. Fortunately, Maitland is situated directly between the high-end boutique shopping available in Winter Park and the more traditional shopping available at the Altamonte Mall in Altamonte Springs. Each area is only a short drive away. This area is known for specialty retail like Restoration Hardware and quaint shopping centers like Winter Park Village and the very popular Park Avenue area, hosting a number of popular shopping, dining, and entertainment options. The Altamonte Mall has staples like Macy's, JC Penney, and Dillard's. It also has one of the region's few Apple stores. If you're shopping for groceries, residents east of I-4 are served by a location at the corner of Horatio and 17-92. Those residents further west may want to shop at the Publix near the corner of SR 434 and Maitland Boulevard. 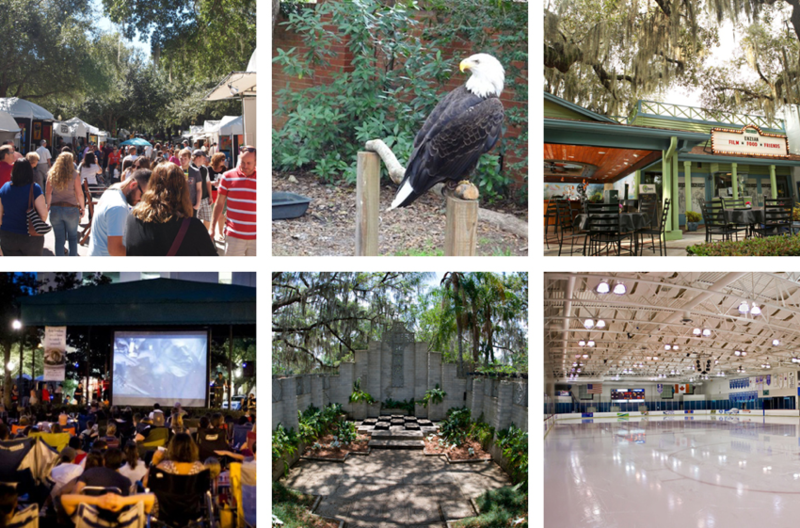 Over the past several years, Maitland's business community has grown exponentially. The primary center of commerce is the Maitland Center. Roughly 400 businesses employ over 12,000 people. The Center is comprised of over 45 office buildings spread over 190 acres and is located directly adjacent to I-4. Geography is part of the Maitland's attraction for businesses. This area is only 30 minutes north of the Orlando International Airport, and it's centrally located to many of the area's centers of commerce. All of these factors have combined to yield a high rate of growth that doesn't seem to be showing any signs of slowing. Maitland has a number of major road arteries running through it that connect along State Road 414, making this a great area for Orlando commuters. State Road 414 is split into a free section that starts in the east at 17-92, known to locals as Maitland Boulevard, and a toll road section that connects Maitland to the 429 and beyond. I-4 provides quick access southbound toward Downtown Orlando and northbound to Altamonte Springs. There are times during rush hour that traffic can bottleneck around the intersection of Maitland Boulevard and I-4, but many locals would argue that it's better than the area's other Interstate ramps. When the Interstate backs up during rush hour traffic, 441, 17-92 and 434 are easily accessible and can be great alternatives for an easy commute.